Dunedin is the farthest city from London. I was as far from home as it is possible to get. Leaving Dunedin was the beginning of the end of the love affair between me and the bike. Following the advice of the hostel owner over the lonely planets cycling bible, I headed out to Mosgiel, rather than the coastal route, to join the highway 20km from the city centre. Leaving Dunedin is rather like a spider getting out of the bath, pick which hill you would like, they are all going to crack you! About 3 hours later, google maps being refreshed 30+ times, having consulted several workmen and vans, I was in Mosgiel. I asked a man whether I could now join the highway, and ended up sitting with him kerbside putting the world to rights on his lunch break. Kiwis always have time for you! The road to Milton was boring, highway with the occasional thrill of being blown sideways by a logging truck. Truly it’s one of those days where you have to pull out the “at least I’m getting some exercise” or “well cycling is free” card. I set up camp in Milton andI settled in for the night, so did the rain. I retired to bed at 10pm, with heavy rain and lightening setting in. 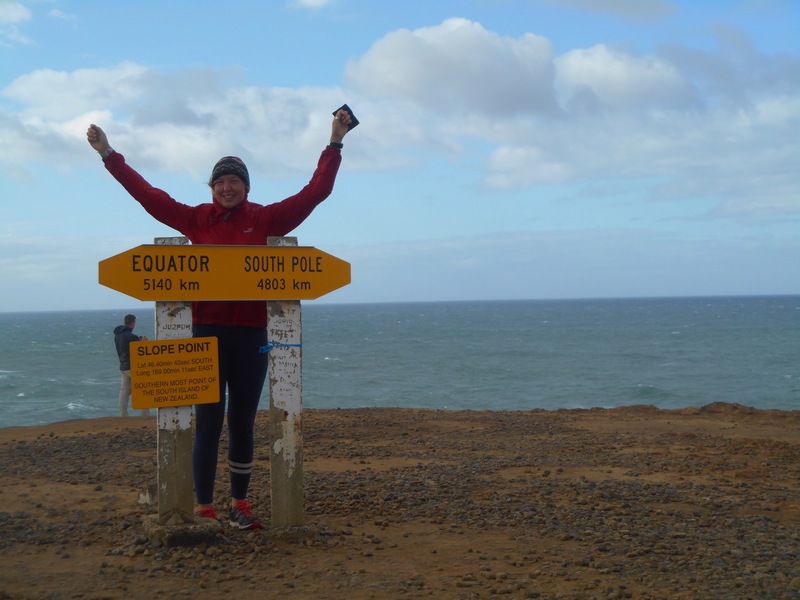 At twenty past ten, I was awoken by the dripping of rain directly into my sleeping bag, so I gathered up and moved to the little kitchen where I spent the night cuddling my knees on a little couch. Come morning, I was seriously rethinking the journey south. The camp owner offered I could stay another night for free, a kind gesture, if not one I was excited about taking up. 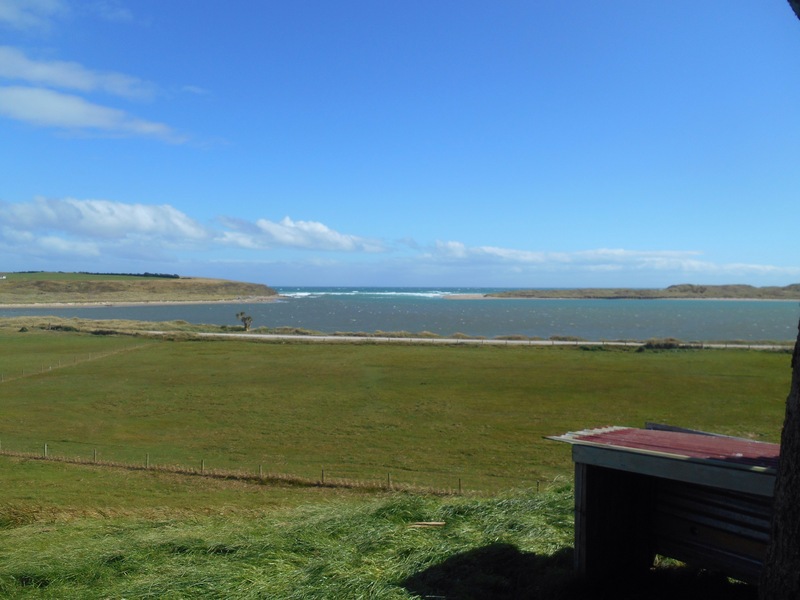 At the information centre the little old lady assured me the rain was a one off and sent me excitedly packing for my Catlins adventure, announcing I was “fit as a trout.” I felt chuffed, although wasn’t really aware of trouts being adorned for their athleticism! 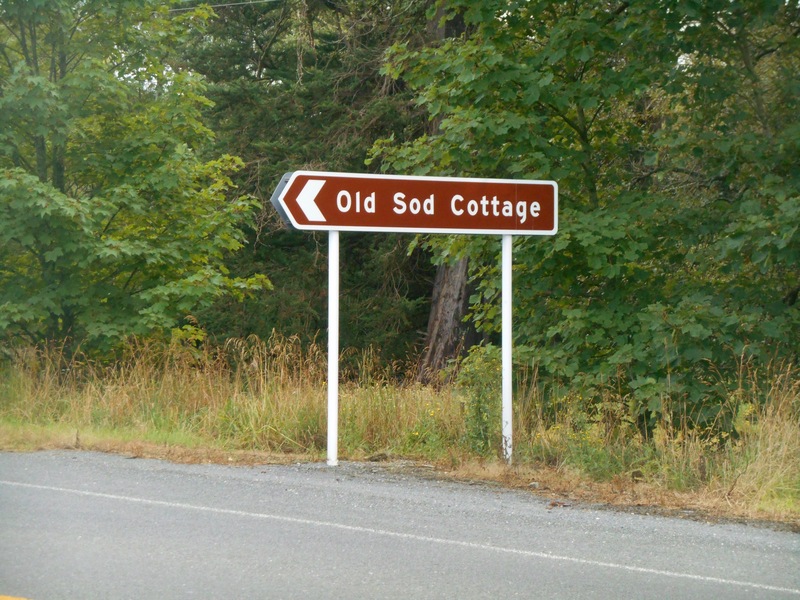 Balclutha was my lunch stop, on the way passing Old Sod’s cottage which was a lovely landmark. I set off with the rain to Owaka and arrived wet and defeated a few hours later. Luckily, the hostel was as homely and welcoming as it is possible to be. The manager even making special effort to remind you to shut your bedroom windows and commenting on the tidiness of your room, just in case you were missing living with your parents. He was astonished I had missed Nugget point, an off shoot of the journey I had just taken. I reassured him that in my current state of mind, it could have been an audience with the queen and I wouldn’t have taken the detour. He organised for me to carpool with the next guests who arrived to go out exploring. 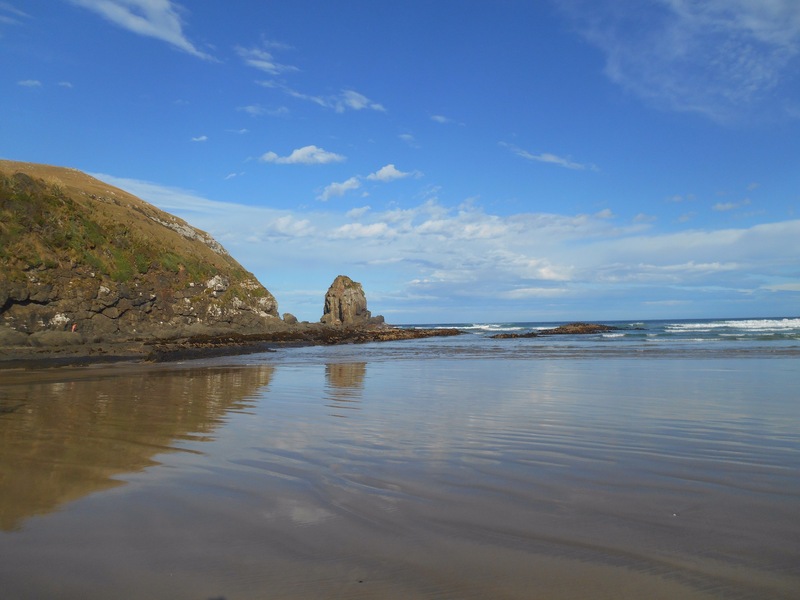 The evening was bright and warm and we headed out to Cannibal Bay, a beautiful stretch of beach with craggy rocks. We spent the journey there inventing reasons why it may have got such a peculiar name. 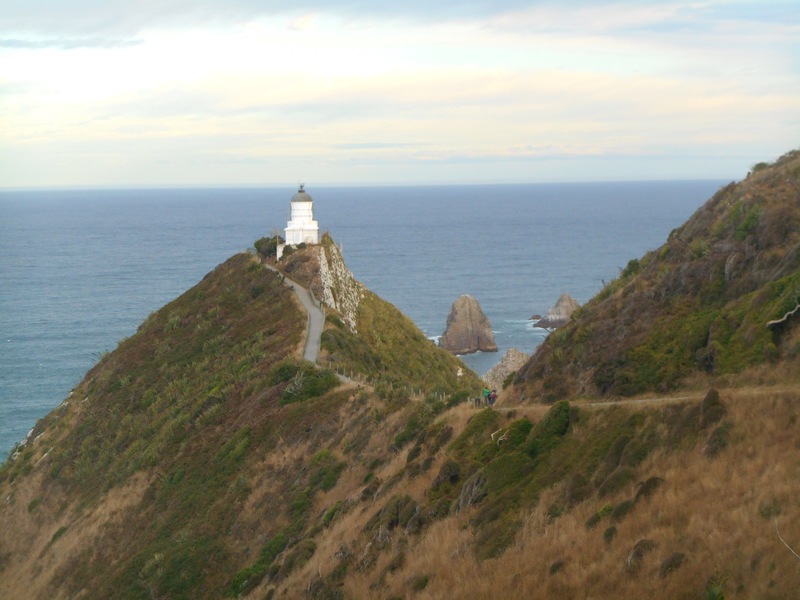 We then took the gravel road upwards and onwards to Kaka point and then nugget point, marked by a beautiful lighthouse. On the way we saw several Falcons, an impressive bird. The road was windy and steep and I was most relieved I hadn’t tried to peddle there. The lighthouse balanced on the end of a just out to sea, the banks steeply dropping away to the water below. In front of the lighthouse were rocky outcrops, the ‘Nuggets’ and there were sea lions on the beach below. 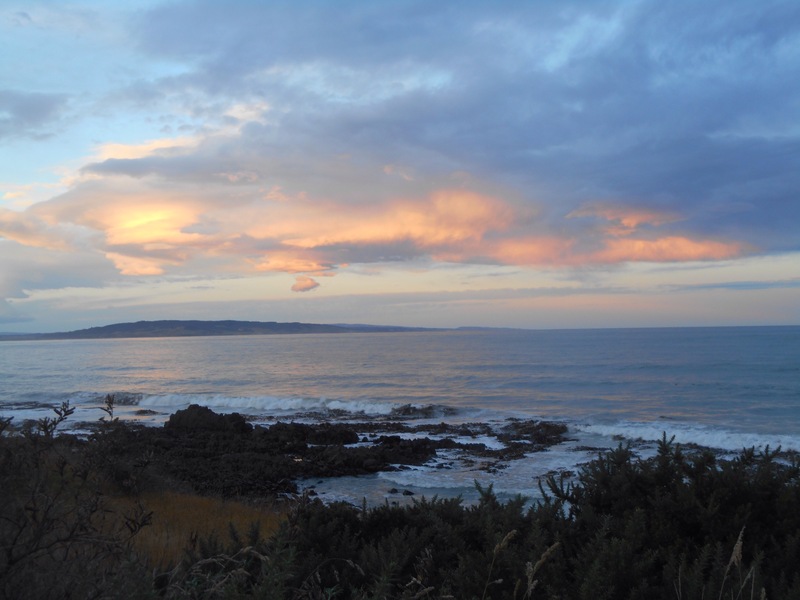 In that warm evening with the sun setting colourfully over the sea, I knew that the Catlins would be worth the toil. 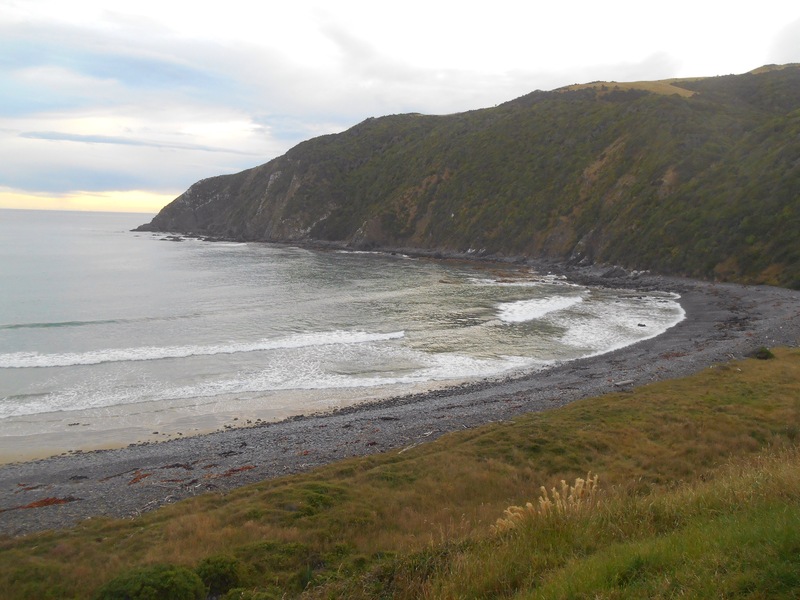 At neighbouring Roaring Bay, with dusk setting in, we watched the yellow eyed ‘Hoiho’ penguins returning up the beach after a day’s fishing. They can dive as deep as 80metres looking for goodies, an amazing feat. They took a slow walk up the beach, stopping for long periods of time to adapt to land again. One penguin looked like he had had a particularly rough day as he was wounded on his right side and limping. At this time of year, the young are maturing and losing their baby fur. You could hear parent and baby chirping loudly to the returning parent from the undergrowth. Getting into bed that night was like crawling into a cocoon. Even the bedsheets smelt like home. The next morning I took breakfast with some girls who would be passing my evenings stopping point and agreed to take my luggage on ahead of me. I then discovered a puncture in my back tyre and set about changing my tyre and inner tube, aided by a friendly neighbour. I really felt like I was facing every challenge, and relying more than ever on the helpfulness of others. 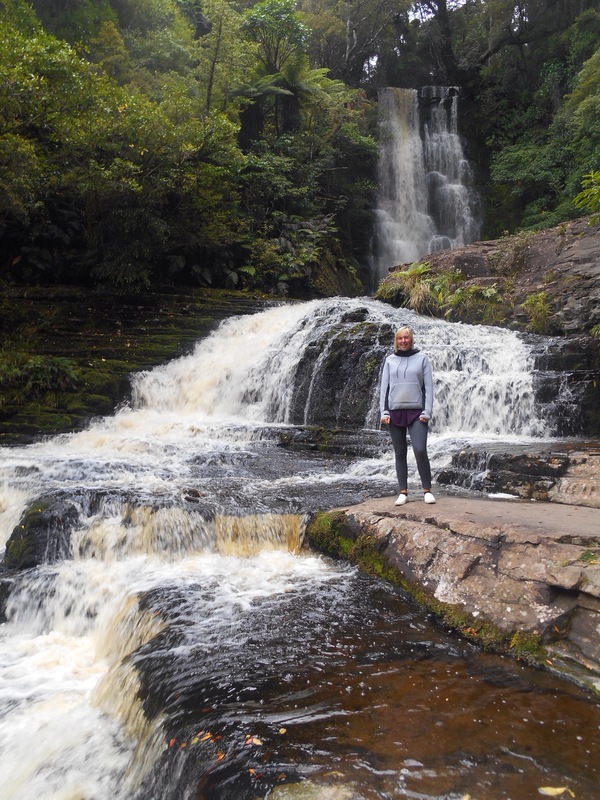 It was nice to be free of the load and I headed to Purakaunui Falls, one of the most pictured parts of the Catlins. 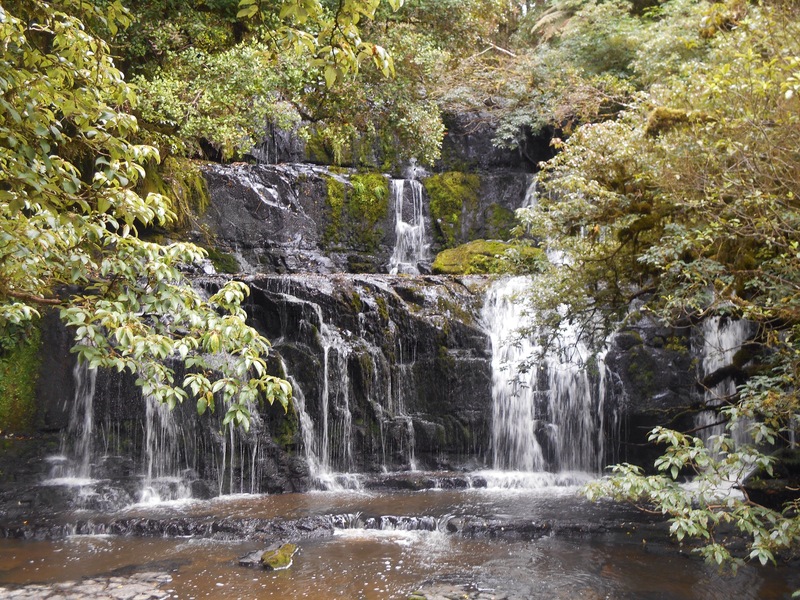 The neat three tiered falls were a short walk from the road, through leafy green forest. 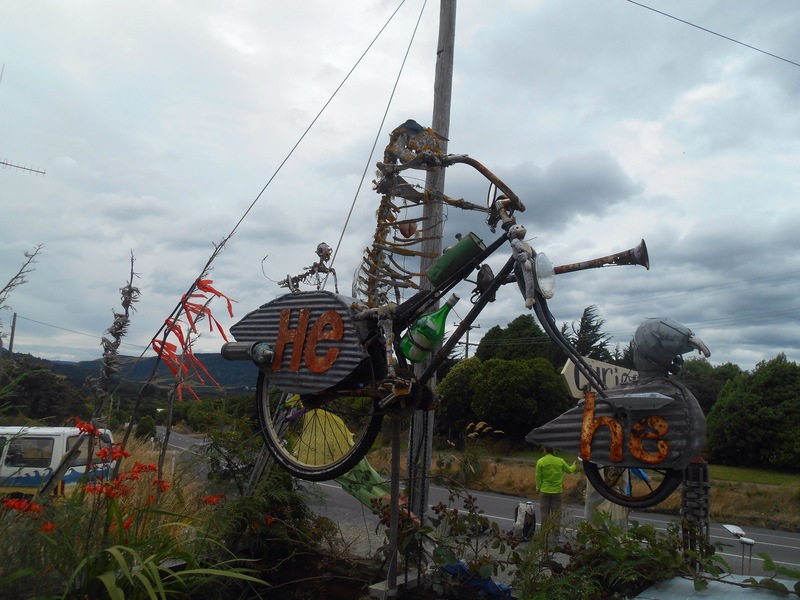 Then I climbed again on the unsealed road to Papatowai where I found a little coffee shack and novelty gallery, the Lost Gypsy. The owner of this caravan was an engineer who had taken odds and ends and turned them into mechanisms, toys and gadgets which were fun to explore. There was a train ‘of thought’ which ran around the gallery, little musical instruments and pulleys to control various things and it was fun to lose an hour or two there. I then pressed in to the Whistling frog where my luggage had been dropped with a little sign of its own saying ‘Lauren.’ I set up my tent, locked the bike and set about seeing the sights by the kindness of others. The first car that passed took me the 4km to the McLean falls, virtually impassable by bike. Again it was a short, green walk to the thundering falls, a 22m drop poured over by a powerful surge of water. The sound of the falls blocking out all else. After returning to the top of the road I sought a lift in the other direction, to Cathedral Caves. Only open during low tide, it is only possible to visit for about 2 hours each day. This network of sea caves is accused by a longer walk to a pristine stretch of coast. 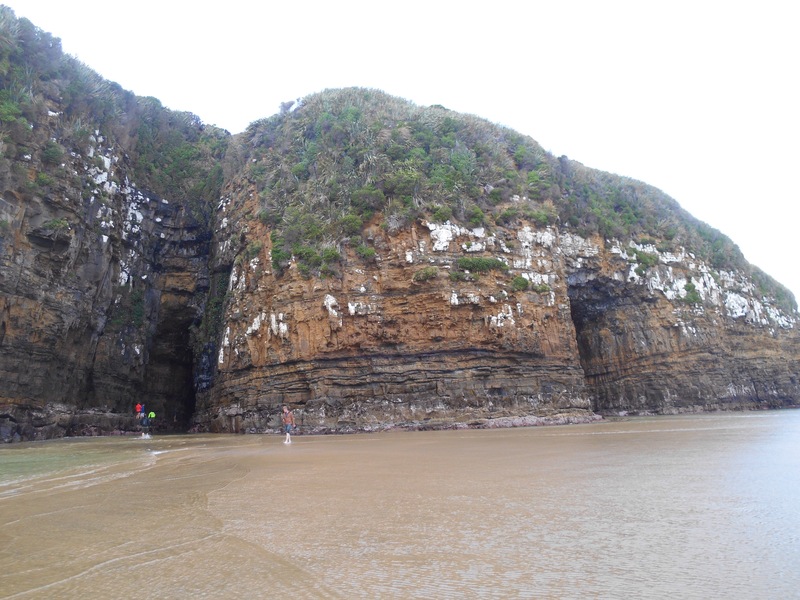 The two main caves form a network of 199metres carved from the rock, accused by wading by knee height water, or waist height if you timed it wrong. 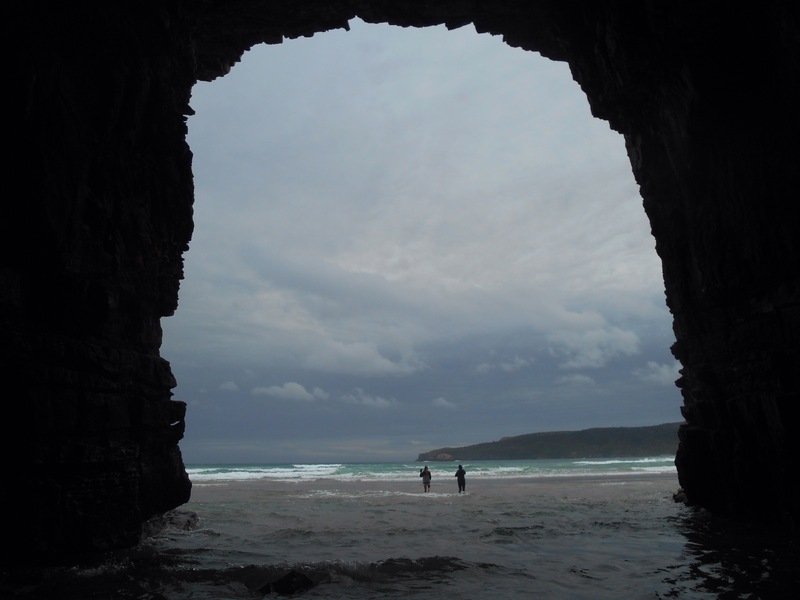 The caves are as grand as the name suggest and looking back out to sea form the perfect picture frame of the south coast. In the caves I met people from my hostel in Dunedin and legs numb from the water, we climbed back out from the beach together. With this very underpopulated park, I ran a very real risk of running out of food, so at the overpriced cafe I afforded myself a piece of cake and a coffee before setting off further into the park. The ride was mostly downhill to Curio bay and I made it by lunch time, not that I had exciting lunch options, some celery and peanut butter showing the dire straits of the situation. 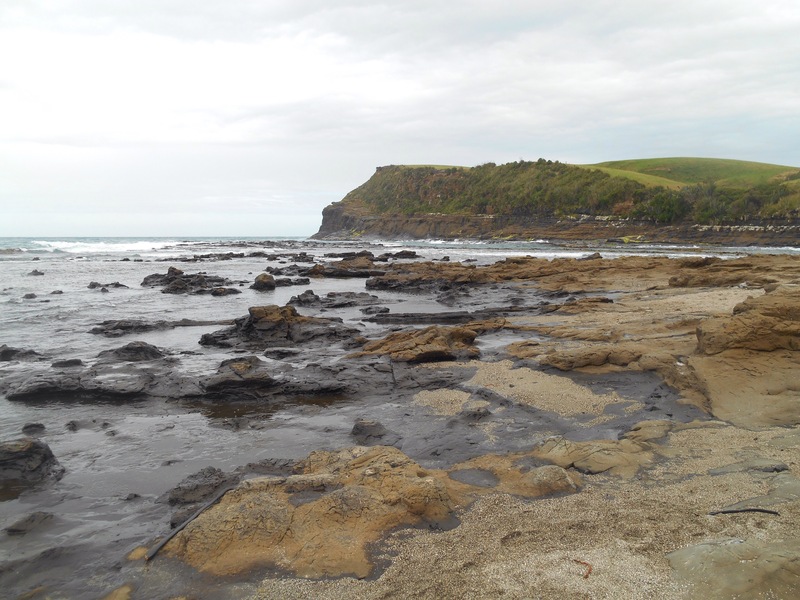 Curio bay is an amazing petrified forest, covered at high tide by the sea. The remains of these petrified trees are visible through the shallow, clear waters on this secluded southerly bay. 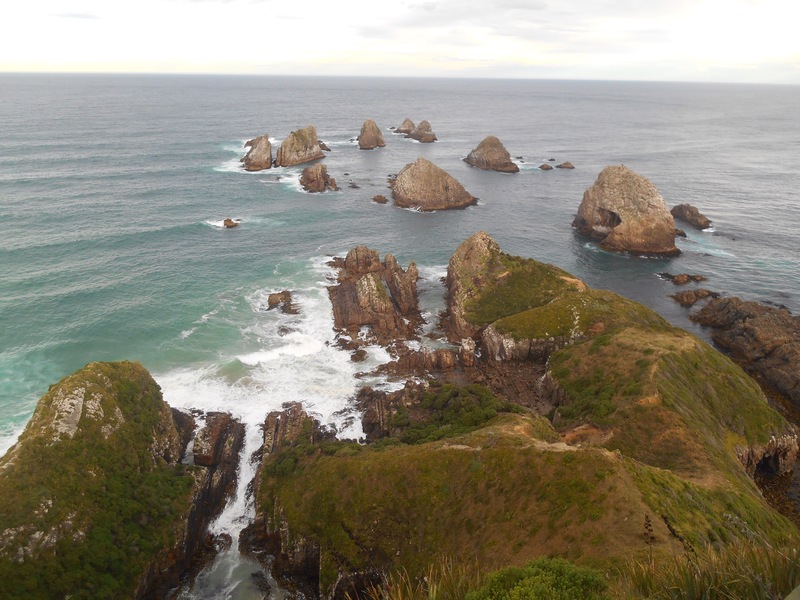 Just along is porpoise bay where the tiny Hectors Dolphins love to frolic in the waves. Immediately you can see several fins as they race around, darting in and out of the water. It is unsure why they love this spot so much, maybe just slightly protected from the south coast but with strong surf for them to play in. After observing for 20 minutes or so I plucked up the courage to strip down and get in. Granted the water can’t have been more than 10 degrees but how often can you swim with wild dolphins for free? Before long my body was numb, but the thrill of having them pass by you playfully kept me in the water for a good while. Every time there was a good break, 12 of them in a line surfed it, giving you a perfect view of their grey and black bodies in the clear water. They lept and sprang showing that the chill wasn’t bothering them! After this it was a chilly ride to Slope Point Farmstay where I would spend the night. A gravel road treated me all the way there and I was relieved to make use of the shower, the washing machine and ultimately the bed! In the morning I caught a lift with some Dutch backpackers to slope point, New Zealand’s most southern bit of mainland. This blustery coastline is incredibly windswept, the trees bent double, giving up their protest to the ongoing intrusion straight out of Antarctica. The wind was so strong it was hard to breathe. It was a struggle to walk against but great fun to recline backwards supported by the gusts. 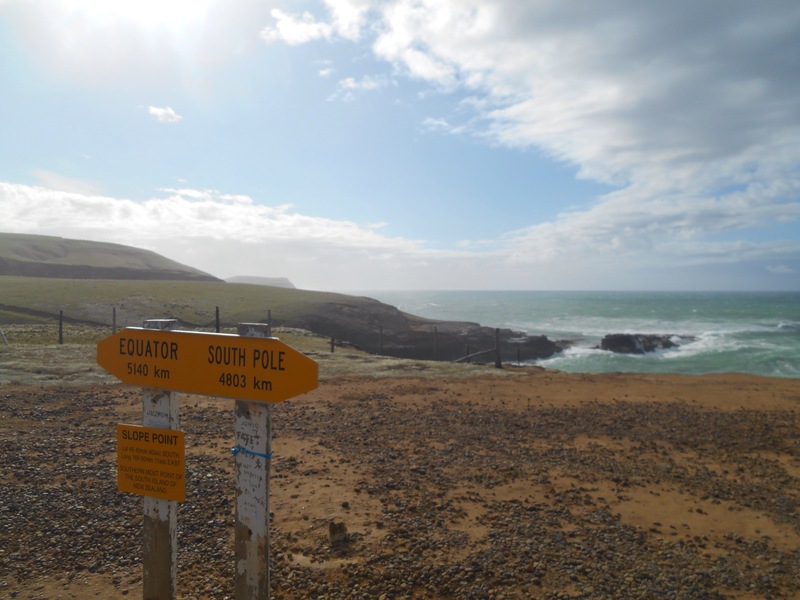 A small sign announced this was New Zealand’s most southerly point. Back on the bike I headed out of the park, just needing to make it 60km to the highway to pick up the bus north the following day. Physically this was challenging, mentally this was impossible. I found myself fighting the same headwind I have just described, occasionally battering me from the side instead of the front. To add I had eaten my last emergency rice meal for breakfast only made me more desperate to reach the parks limits. I only had a cereal bar, sympathetically thrust upon me by the Dutch guys to prevent my starvation. When I got to small town Fortrose I bought myself lunch and pleaded with the man to find a way for me to get to the bus 40km away by the morning, without biking. He stood looking at me unconvinced for several minutes, then went off to text his friend. His friend was obliging, leaving Fortrose at 5am. With that, I went off to find myself a garden to sleep in part the night, the early morning wake up doing nothing to dampen the excitement of not having to battle any longer. To put it into perspective, in the cafe I met a lady who I had chatted to weeks earlier on the Otago Rail Trail. She was travelling the other direction and averaging 20 miles an hour, I was averaging 6! To say was it worth it would be more easily answered in two questions. Am I pleased I did it? Extremely! Would I do it again? Never! Next You shall not [Arthur’s] Pass! dolphin swim sounds amazing lauren!